Edit 2012: I had to correct myself. 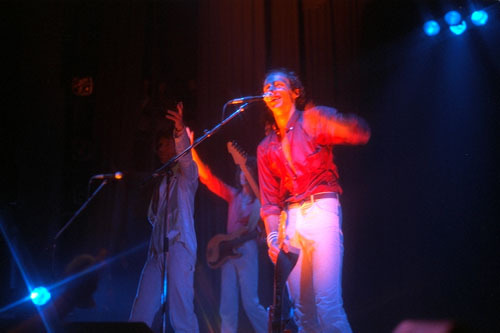 These pictures were probably from the next day, October 29, 1978, when they played in Berlin (compare this blog post). 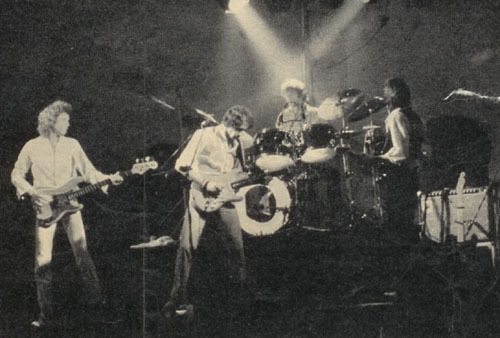 Unlike these days, when each concert is not only recorded on audio or video, not to mention all pictures made by a million people it seems, there are hardly pictures from those early Dire Straits concerts. Too bad digital cams were not invented yet. I often see pictues on bootleg CD covers people made, or on other places, but it seems many have some problems to tell if a picture is from this year or that. 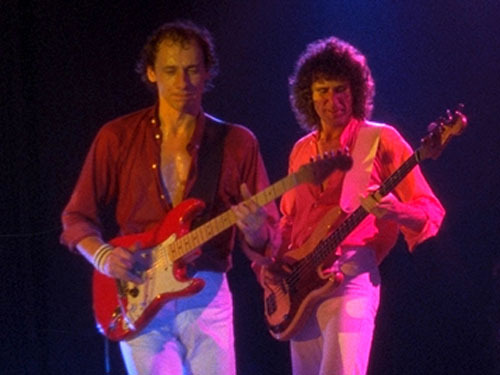 In fact, for probably 90% of those old pictures it is totally unknown from which concert they were. I am meanwhile pretty good at dating such pictures and I can narrow down them to a few weeks or a particular tour. I just have to look at amps, guitars (especially David’s), and other details. I might do another post about this later. 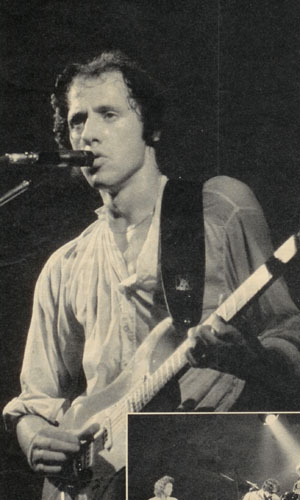 For now, only one very easy but a 100% consistent rule how to tell if a picture is from between 77 and October 78, or later, is to look at Mark’s guitar strap: Before October 78 Mark had a rather thin brown guitar strap, after this date, up to the end of 79, he had a wide black guitar strap (with the red Strat, there were different ones for that black Telecaster). 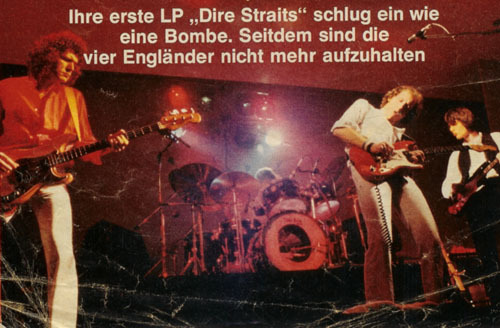 BTW, there is a bootleg recording of Hamburg available but it runs at a too high speed and thus sounds really strange. If you speed it down you will notice that it is really a gem, Mark’s concentration level and spontaneity were outstanding once again. edited: I added a sound sample from this concert (Lions), click here for more info. 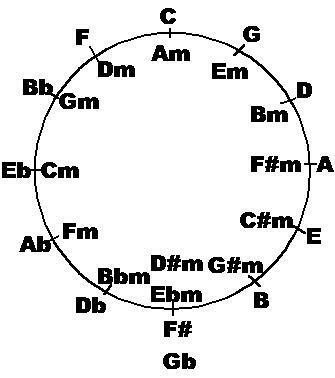 What is the Circle of Fifths and what do I need it for? Every guitar player pretty soon realizes that certain chords seem to belong together, they are related in a way, while other chords are only rarely used within the same song. The chords C , F, and G seem to be such related chords – these are not only the chords you would use for a blues tune in C, but also the majority of traditionals – if you play them in the key of C – do not require any other chords than these three. So, how do I know which chords are related, which ones are even closely related, which ones are not? 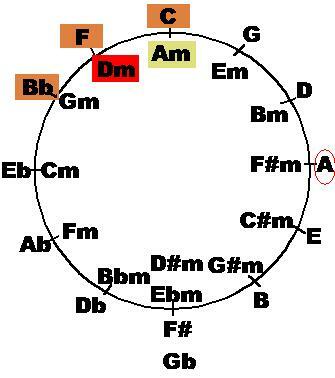 The answer can be found from a simple chart that is called the “Circle of Fifths”. I will simply skip all the redundant information like “why a circle, why fifths – or sometimes even ‘fifths and fourths'”, instead let’s only look at some practical use it can have. More theoretical information can be found at countless places, e.g. here the Wikipedia link. 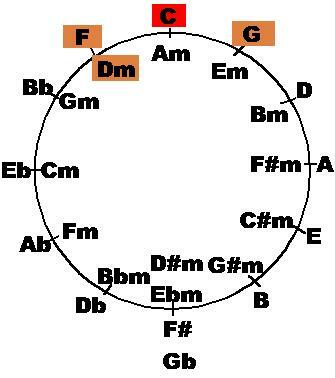 To keep it really simple: Outside the circle you will find major chords, insides are minor chords. Each major chord has a corresponding minor chord (e.g. Am belongs to C, C#m to E, ..). 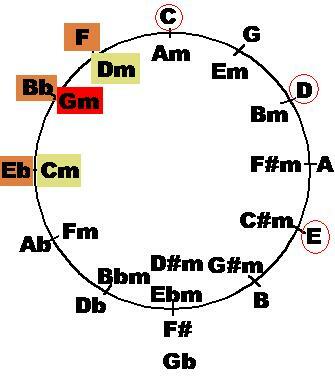 Rule 1: The closer the chords are in this circle, the more they are related ! For example, we have a song in the key of C. The right neighbour is G, the left is F. –> F and G belong to C (the right neighbour is the so-called dominant chord, the left one the sub-dominant chord). Let’s add some minor chords: Am belongs to C, Dm to F, and Em to G. –> We get the chords C, F, G, Am, Dm, Em. On the other hand, a C#m would be very far away from our C, so it is not related, does for this reason not appear in many congs in C, and would sound rather ‘strange’, or at least ‘surprising’. Rule 2: In a minor key, the left and right minor neighbour chords (in the key of Am, these would be Dm and Em) can also appear as a major chord (D or E). So, a song in Am might not only have chords like C, F, G, or Dm, but also D and E.
That’s all you need to know, easy, isn’t it? Now, what do I need it for? Well, to write your own songs (make it sound ‘normal’, or deliberately use strange chords, as you want) , or to figure out the chords of a new song you want to learn by ear: as soon as you have the first chord, try to find the other ones by trying out neighbour chords, often these are the ones you are looking for. The key is Dm. All chords of the song: Dm, C, Bb, F, and A. See the next picture: all the chords are pretty close, only the A (right side) does not fit in. If you apply rule 2 (the Am can be replaced by A), everything is in place again, all the chords are “one family”. (Note: some of the long live versions also have a Gm and Am chord, I left these out, but note how these would also fit in). (some of the long live versions also have a Gm and Am chord, I left these out, but note how these would also fit in). The key is Gm, all chords are: Gm, Bb, F, Eb, C, D, and E.
The C, D, and E chords seem to be out of place (see below), the C and D can be understood as replacements for a Dm and Cm chord (rule 2) and do thus fit into the pattern, while the E is completely out. In fact, this chord sounds somewhat unexpected (it is the last chord of each refrain, on “color TViii-iiih”), especiall the following change back to Gm is very unusual and thus adds some extra kick. Alright, that’s for today. You should use use the comment function (no registration or email required) to let me know if this article was helpful, or to ask questions, or to make suggestions. 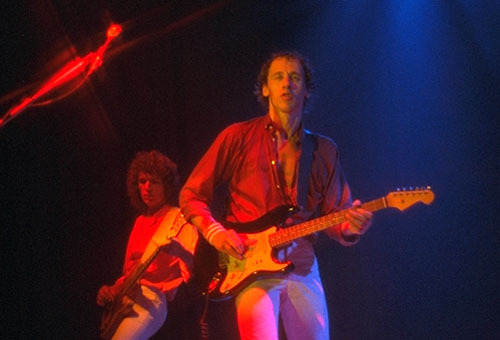 The song Eastbound Train is a boogie groove in the key of E. It was the b-side of Dire Straits’ first Single Sultans of Swing, and has been played live on most concerts during the first two years of Dire Straits. Below you will find an explanation of the opening chord (listen to sample, live at the Hope&Anchor, London, 1977). In blues-based tunes – and a boogie is often just an up-tempo version of the good old blues scheme – each cycle of the chord progression pattern can end on the dominant seventh chord. This chord always starts with the 5th note of the given major scale; so in the key of C we have a G7 chord, while in the key of E we would get a B7 chord. By the way, ending on this chord is also called turnaround. And often a turnaround is used to open a blues tune – in other words, you start with the dominant seventh chord or with a phrase running over it. This is the case in Eastbound Train. It starts with the same chord that is normally the last chord of the chord pattern. Since one note of the B7 chord is raised – this is also called augmented – we have an augmented B7 seventh chord, in short B+7 or Baug7. For more general information on this chord, see the corresponding Wikipedia article. Left hand fretting: use the index finger on the d-string, 3rd on the g-string, the pinky on the b-string, and the remaining second finger on the high e-string. 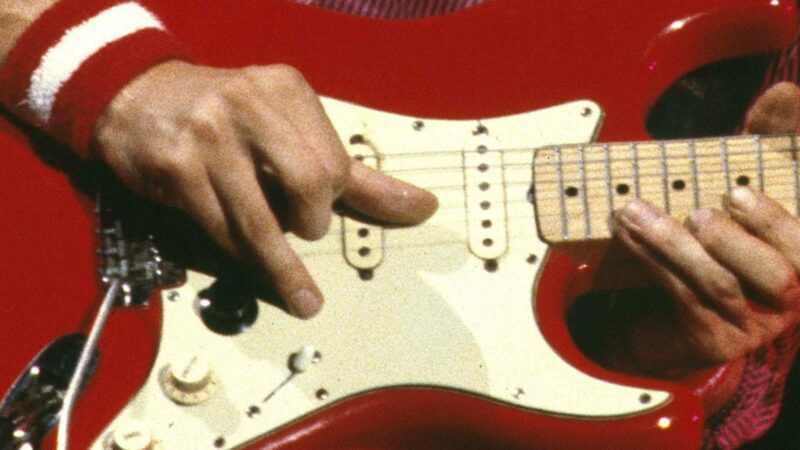 Unfortunately there are only two videos available (Rockpalast 1979, Paris 1978) which show Mark Knopfler playing Eastbound Train, and both don’t feature close-ups of his left hand when playing this chord, so the following two pics are the best ones we have. 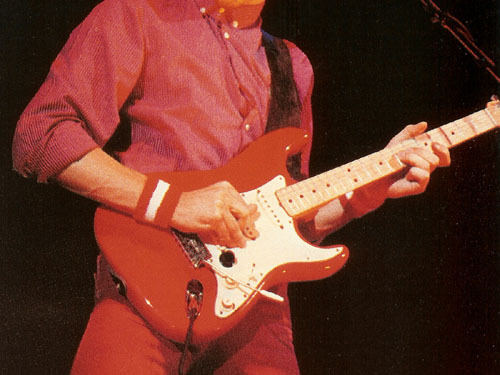 Before Knopfler changed to the Schecter Strat in 1980, he played two red Fender Strats with Dire Straits, one with a rosewood finger board (SN 68354) , one with maple (SN 80470). Have you ever wondered which of these guitars was used on which of the many bootleg concerts that are available from that time? 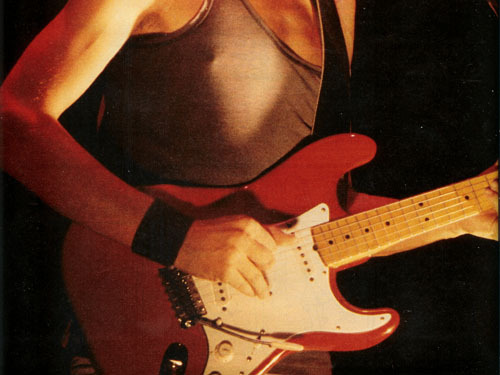 Remember the guitar lick In Sultans of Swing following “and Harry doesn’t mind..” ? 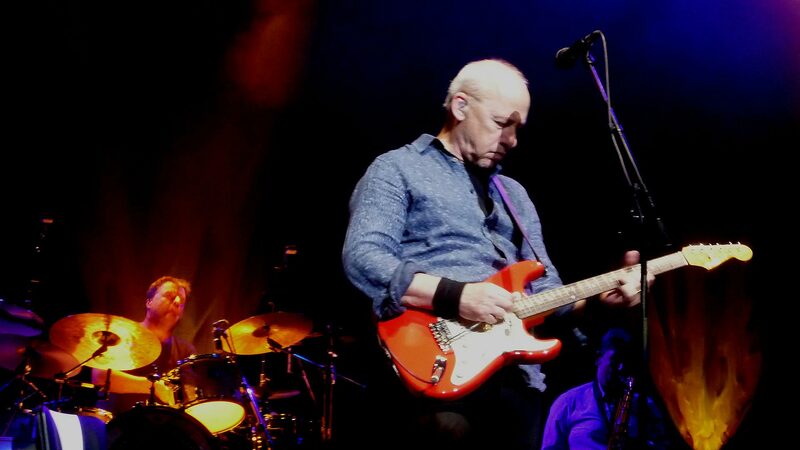 In fact this is the way Knopfler seems to play it on many old or new live recordings. This is more difficult which might be an explanation why is was only played in the studio this way. 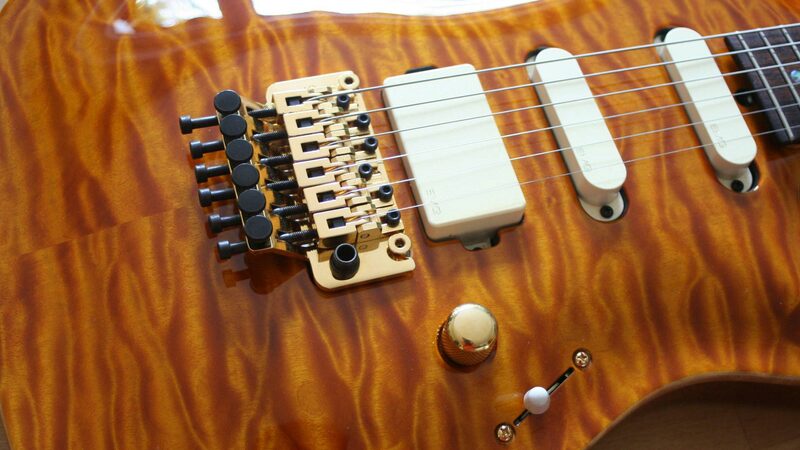 The problem is you must be very careful not to mute the b-string accidentally with the finger that bends the g-string. If you play it this way, you can make it scream more, also you can release the bend and both notes will perfectly match the following Dm chord (listen carefully, this was what gave me the idea to this). 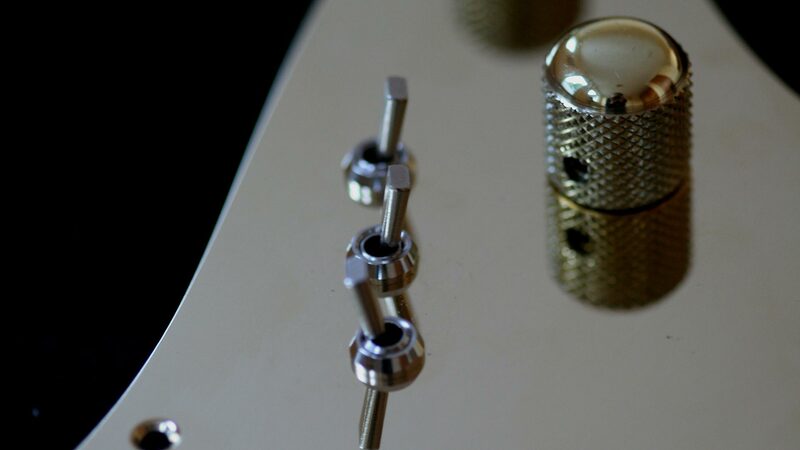 See this article for one of my youtube videos where I also demonstrate this bend. So, here is my first post in this new blog. 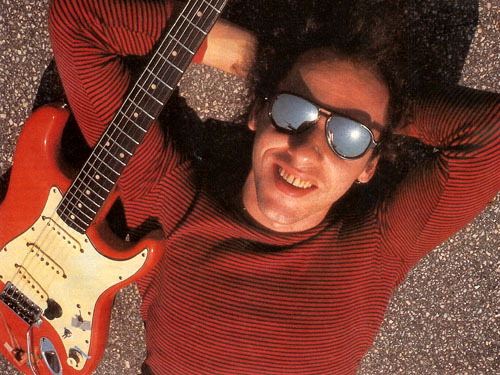 The idea behind this blog is to write about some things I am fascinated in, namely electric guitar and playing it in the style of the unique Mark Knopfler of Dire Straits fame. 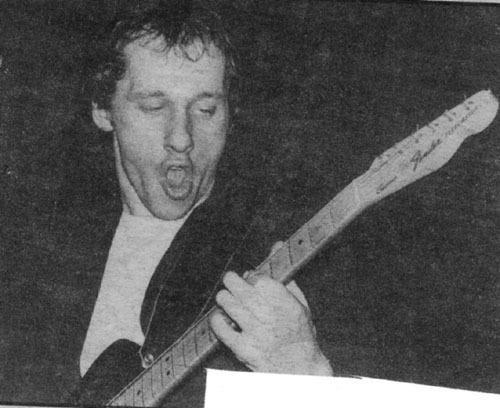 I created the Dire Straits Guitar Page, one of the earliest and best-known sites about this topic, in 1996. It was soon quoted and copied almost everywhere. 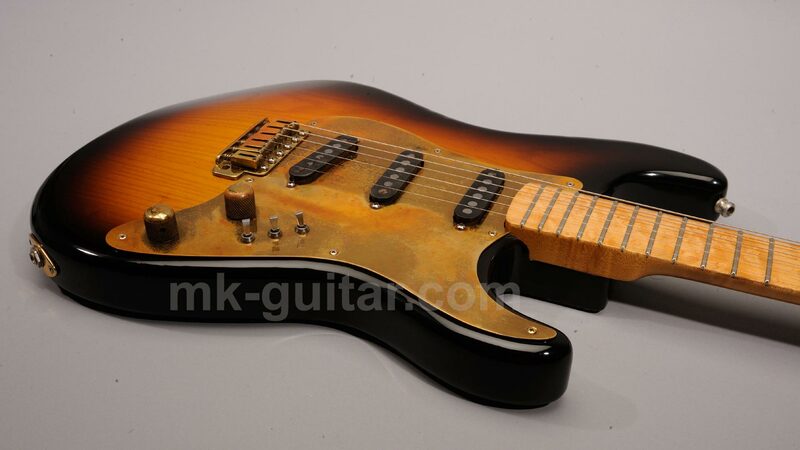 I didn’t find the time to update it regularly, later I planned to create it completely new at mk-guitar.com. Unfortunately I never found the time for this ambitious project. Maybe a better way to go is with a blog. This way I can write about one single aspect at the time, and let it grow and grow. Also the interaction with other people in a blog seems to be something pretty cool.